The Football Association will study the referee's report from Sunday's East Anglian derby before considering further sanctions against Ipswich manager Paul Lambert and Norwich's head of performance Chris Domogalla. 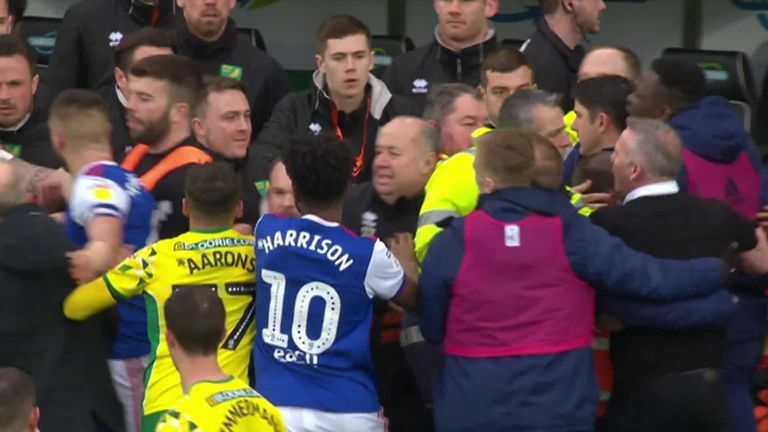 Both were sent off just before half-time in the Sky Bet Championship clash at Carrow Road when a Jon Nolan challenge prompted pushing and shoving between players and coaching staff on the touchline. A police officer was also involved in calming Lambert down as he and City's assistant head coach Edmund Riemer were involved in angry exchanges. Having studied the report from referee Peter Bankes, the FA may also choose to charge the clubs with a 'mass confrontation' breach (of FA Rule E20), of failing to ensure that players and/or officials conducted themselves in an orderly fashion. Norwich boss Daniel Farke admitted he was disappointed with the way things boiled over on the sidelines. "Ipswich had to try to break our rhythm and try to annoy us and take our concentration away, but I think the most important thing is that happens on the pitch," he told Sky Sports. Ipswich boss Paul Lambert, meanwhile, said he got involved to help defend members of his coaching team, but says the situation has now been resolved. Watch Ipswich vs Derby or Preston vs Norwich on Wednesday night, live on Sky Sports Football via the red button or on the Sky Sports app.